The Economist has recently published an account of modern Somaliland society, which, despite noting the continuing divisions between residents from the Western diaspora and Gulf state diaspora, praises highly the country’s economic prosperity, entrepreneurialism, and social stability, particularly in contrast to the Somalian state based around Mogadishu. SAHRA HALGAN, a musician, fled Hargeisa in northern Somalia in 1991. The city she left was a smoking ruin; most of the population was scattered. But in 2013, after 22 years living in France and working as a cleaner, she felt the urge to return. “I love France, but my country is called Somaliland,” she says. And so she set up a restaurant. At weekends, it fills up with Coca-Cola-sipping young men in smart shirts and women in bright silk head-dresses. Musicians strum the lute-like oud and sing folk songs, as plates of camel meat and spiced rice circulate and the audience hold up their iPhones to take selfies. Stories such as Ms Halgan’s abound in Hargeisa, the capital of Somaliland, a breakaway region which declared independence from the rest of Somalia in 1991. 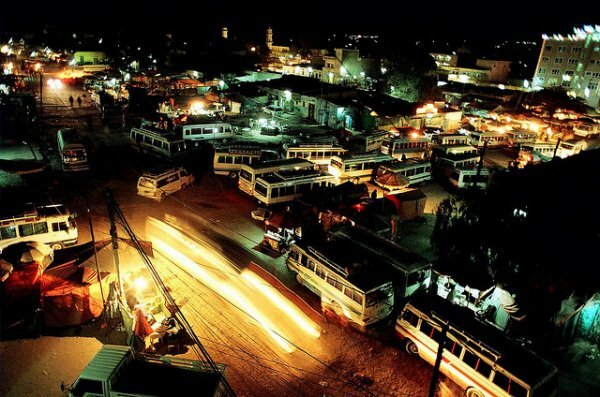 Unlike Mogadishu, the capital of Somalia proper, Hargeisa is broadly safe, and undergoing a remarkable economic boom. On its dusty streets, goats compete for space with Land Cruisers; new businesses such as “the English Beauty Salon” and “the Scandinavian hotel” are everywhere. In cafés Somalis with accents from London, Minnesota and Amsterdam sip frappuccinos. The boom is an indicator of how successful other parts of Somalia could be if the fighting could be stopped. But it also comes with tensions that could undermine the fragile peace. Almost every building in Hargeisa has been constructed in the past two decades. In the city centre a Russian-built MiG is mounted on a crudely painted plinth: a relic from the Somali civil war, which ran from the late 1980s until 1991, when the city was comprehensively destroyed by Siad Barre, Somalia’s last military dictator. The war convinced many that they wanted nothing to do with any government in Mogadishu. On the plinth is the date “26th June”, the day on which, in 1960, Somaliland gained its independence from Britain, five days before it formally joined Somalia, newly independent from Italy. Most Somalilanders think the union was a mistake. Recovery began with refugees sending money home through the hawala system. It accelerated dramatically in 2009, when Saudi Arabia lifted a nine-year ban on imports of livestock from Somalia. Last year some 5m animals were exported, more than for 20 years. The animal trade generates money which can be spent on consumer goods: shops are full of Vietnamese clothes and Chinese electronics. That in turn creates opportunities for investment, and so diaspora Somalis who had previously mostly sent money home began to set up businesses. They have helped to build a world-class mobile-phone network, a fibre-optic broadband link to Djibouti and a mobile-money system which is one of the most widely used in Africa. Mahdi Abdi moved to Hargeisa in 2013 from the suburbs of Washington, DC; he had left Mogadishu in the 1970s as a teenager. In his American twang, he jokes about his mid-life crisis. “I had the house in the ’burbs, the dog, the business, everything.” But Hargeisa seemed more exciting. In his dental clinic he proudly shows off imported equipment with which he can build proper crowns and dentures—unknown until now in Somaliland. Those who have lived abroad have plenty of advantages. Those with foreign passports can travel to business meetings. In a country where the local currency is traded in brick-sized bundles, they have greater access to foreign money (almost all large transactions are dollarised). Most of all they have education, which, 20 years after the civil war, is sorely lacking. More than a dozen universities have opened in Hargeisa over the past decade or so, hawking degrees to hopeful youngsters (the median age in Somalia is around 17). But few trust their quality. But not all members of the diaspora are welcome. Newcomers are buying up land, pushing up property prices—which, in a country with a creaking legal system, can lead to bloody disputes. Their teenage children, whom Somalilanders often send home for the summer, are accused of flashing money around, flirting and generally making a nuisance of themselves. And tension simmers between two different diaspora groups: Westerners, and those from Saudi Arabia, Yemen and the other Gulf states. Like Mr Abdi and Ms Halgan, Westerners tend to get busy setting up businesses such as cafés, restaurants and clinics. Those back from the Gulf, by contrast, are more involved in the import and export trades, livestock and the construction industry—through which they can exert a worrying political influence. “This society used to be half-African, half-Muslim, not too deeply religious,” says one well-connected Somalilander. “Now the Wahhabis are everywhere.” The country’s early democracy has faltered: an election in Somaliland planned for this year has been delayed, ostensibly because of problems organising it. Corruption is endemic, and the media is seldom critical. Dissent is increasingly dangerous, particularly on the fraught issue of national identity. On September 27th, four musicians were arrested on their return to Somaliland: they had apparently waved a Somalian flag at a gig in Mogadishu. They were released only after widespread protests. Still, life remains much better than in Mogadishu, where car-bombs and shootings continue to punctuate the night. The question is what happens next. Independence, most think, is a pipe-dream: politicians in Mogadishu are unlikely to want to lose a substantial chunk of the country. African neighbours such as Ethiopia, whose troops guarantee security in much of the rest of Somalia, will not approve either; nor, for that matter, will the West. No country has yet recognised Somaliland’s self-declared independence. But for a million or so Somalis living abroad, Hargeisa offers a model for how they might return to their homeland and to try to rebuild. If only the rest of Somalia could catch up.